Ah… hummus, a popular dip that you can feel good about! Addictive and so healthy. 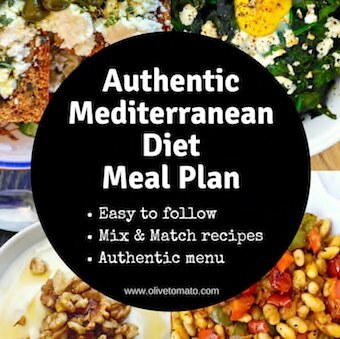 Many people mistakenly think it is also Greek, unfortunately it is not, it is a Middle Eastern recipe that exemplifies the qualities of mediterranean cuisine wonderfully and fits right in with the mediterranean diet. 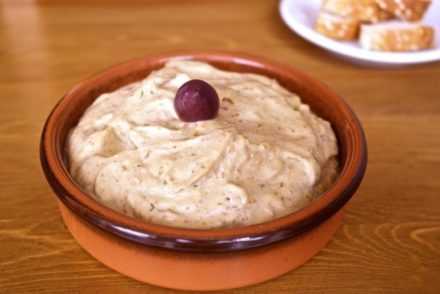 While the original hummus is made with chickpeas, making it a great way to get beans in the diet, there has been a movement towards other types of hummus, although technically they are not hummus if they do not contain chickpeas, since the word hummus means chickpea in arabic. These other hummus-like dips are also tasty and interesting, made with other beans or even carrots, cucumber and edamame. 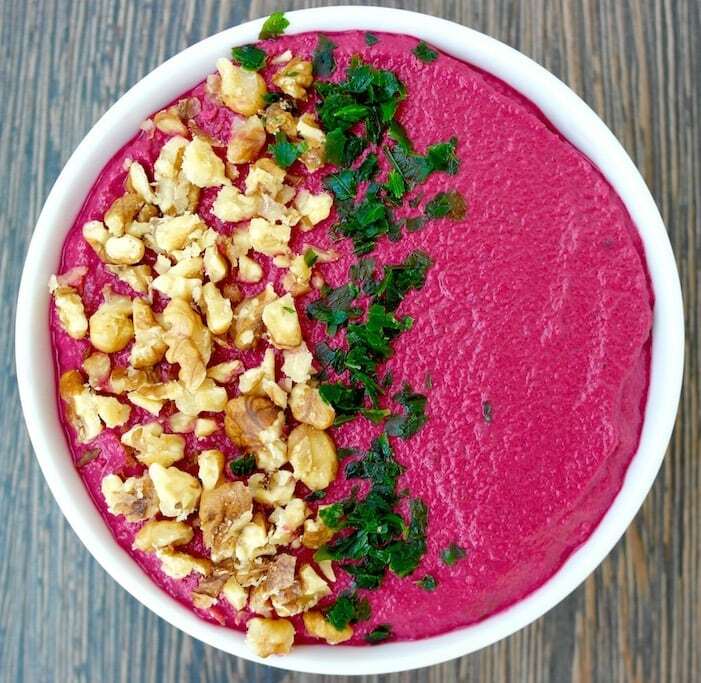 For this one hummus-like recipe, I used beets as well as tahini and walnuts, there are no chickpeas. The beets provide a sweetness to the dip, but also several antioxidants such as betaine and betalain that can protect from heart disease and have anti-inflammatory properties. Tahini and walnuts are great sources of the hard-to-get omega-3 fatty acids and of course you have the addition of olive oil with its polyphenols as well as lemon juice, garlic and cumin also rich in antioxidants. 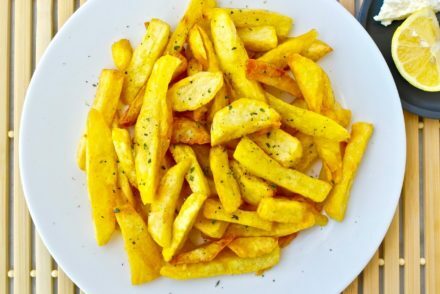 I also want to add that this particular recipe uses less olive oil than your typical hummus recipes, so that saves a few calories, if you are worried about that. The result is delicious without being heavy and tastes best after being in the refrigerator for a few hours. We literally wiped the bowl clean. Now this is what I call a nutritional powerhouse! 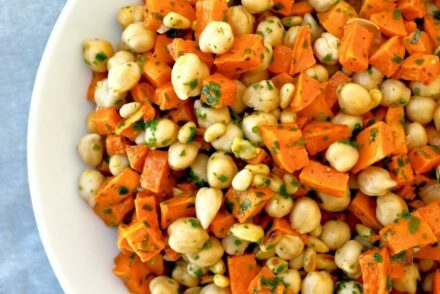 To make it even better, serve it with carrot sticks, cucumber rounds and some whole wheat breadsticks or crackers or my favorite mini Cretan barley rusks. Add all the ingredients except the olive oil and parsley in a food processor. Blend well until smooth. Slowly add the olive oil and blend. Taste and add salt and pepper as needed. When ready to serve, sprinkle with chopped walnuts and parsley. You can also drizzle some additional olive oil. This looks delicious, when the beetroots come into season here in Istanbul l will give it a go. Wow ! This looks so good ! What a great way to snack on beets !! Can’t wait to make this ! We tried this with a few beets left in our garden. Although they were not fully purple in color, the dish did turn out in a pastel purple. A majority of our family is receptive to traditional hummus, so as long as I don’t keep mentioning beets, it will get eaten. We will make this again soon, I did see some more beets maturing….